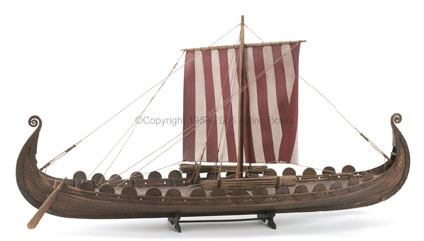 Billings Boats BIL720 Oseberg-Mini Oseberg 1/50 scale wood ship kit! The Oseberg was found in Norway at Oseberg in Vestfold in 1903, resting on a bed of blue clay and covered with turf and stones. The Oseberg was built in the last half of the 800’s and was buried roughly 50 years later. The ship is some 50 to 100 years older than similar vessels which have been found. It lay deep in the water and must have been relatively dangerous under sail.